Last night my wife and I celebrated the end of another day of Boston's utter surrender in the face of back-to-back snowstorms—the trains haven't run anywhere near on time in over a week, yet this cute little do-nothing town still thinks it can somehow pull off the 2024 Olympics—by hiding out in the basement of our favorite hamburger joint until we were stuffed and buzzed enough to not mind trudging down the middle of the unplowed streets to get home. The burgery in question has an uncommonly extensive beer list, with about a dozen fairly interesting things on tap and twice that many in cans. It's a no-bottle zone for some reason, which is fine by me, especially now that more and more deluxe breweries are starting to package their wares in the heretofore déclassé aluminum. Oskar Blues and 21st Amendment have been canning forever, Sam Adams and Sierra Nevada picked up the habit within the past few years, and in the last couple of weeks, Boulevard, Firestone Walker, and Ale Asylum have all announced plans to go metal; who knows, maybe even up-and-coming craft-beer darling Anheuser-Busch will get in on the action. I'm a long-time proponent of canned beer, though it does have one drawback in a bar setting: the opacity makes it impossible for even the most conscientious bartender to tell when a patron's down to his last precious gulp and therefore in need of immediate reinforcement. And on a more selfish level, I regret that cans make it harder to manipulate things so as to ensure that I get to order at least one more beer than my wife had in mind. I always try to finish a beer when she's exactly halfway done with hers; drinking blind means we sometimes accidentally sync up, and it's a lot harder to subtly extend the evening if we both run dry at the same time. But if that's one previously unacknowledged negative impact of canned beer, I'll balance it out by noting that beer cans look awesome. Or at least, they have the potential to. From a design perspective, they offer the beer-label-art community so much more to work with. 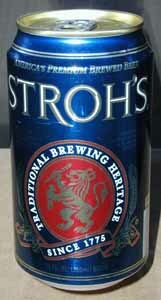 I think the classic blue Stroh's can might still be my all-time favorite, but lately I've taken a shine to the Genesee Cream Ale cans that have been popping up with strange but welcome frequency in Boston-area bars the past couple of years. 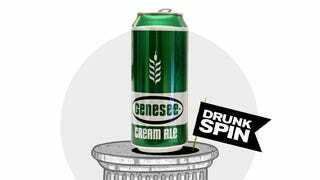 I ranked poor Genny Cream too low on my definitive list of cheap domestic beer. I've given it several new chances lately, and I now think it's a firmly middle-of-the-pack budget brew. The pride of Rochester, NY, doesn't have any unique characteristics, despite the company's claims that cream ale combines "the flavor of an ale and the smoothness of a lager." That just doesn't really mean anything. Broadly speaking, cream ale is a hybrid style that is brewed with ale yeast (or a mixture of ale and lager yeasts), but then subjected to the cold storage from which the word "lager" is derived. But unlike German kolsch, another style that walks the line between ale and lager, American cream ales mostly just taste like standard adjunct lagers. New Glarus's beloved Spotted Cow, the highest-profile craft variety, ain't anything special. And neither is Genesee Cream Ale, but it comes in a downright gorgeous can, it's cheap, and it tastes just fine. At 5.1-percent alcohol-by-volume, it's a tick stronger than most of its peers in the broader yellow-fizz category, and it's otherwise largely indistinguishable. It has a slightly sour aroma that fades with time, a smooth-if-boring bread-y malt flavor, and an abrupt finish that doesn't betray any hint of hops, but also doesn't make you cringe. It's decent stuff. Next time you're looking for a cheap six-pack of tolerable beer in a handsome package, you might as well get Creamed.